These little beasts are quick, and difficult to catch. Several readers have asked about similar damage on orchids they were growing outside in summer and I suggested that the damage was done by slugs. It is not clear if it is the very dry weather promoting this pest or my conversion to large lava rock for a medium. Lava rock provides large spaces where the juvenile crickets retreat during the daylight and makes killing them by hand difficult. Apparently, my small army of frogs that feed at night has not been able to control these pests and I will soon have to resort to liquid Sevin. Summer Culture - It is important this time of year to provide enough water to your orchids so that they can cool themselves in the summer’s heat. If you have a few orchids that have lost their roots or are in the process of re-growing roots, it will be necessary to keep them in more shade. 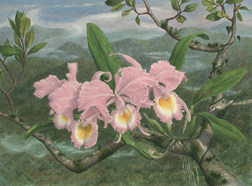 Orchids without roots cannot obtain enough water to cool their leaves when temperatures are high. Withered leaves or a plant dropping leaves is a sure sign that your orchid is using more water than it can obtain through roots.